I'm so sorry if you received a strange message from me. I'm writing my final post. I've enjoyed meeting so many friendly bloggers, but this adventure has to end. I'm in awe of those of you who have found how to balance family, jobs, and blogging. I've tried, but I can't find it. My house is always dirty. When Cate and William came over yesterday, I realized I hadn't cleaned the floors in over a week. My window sills have those little cobwebby things in all the corners. I haven't worked in the yard or even sat on the deck all summer. This is my wonderful scrapbook room. I've spent no time working in it. I want to be more regular with my posting. told me she has a schedule for her posts. I've decided to copy her intent. I'm still trying to decide what days for each. For today, I'm going to show my latest Goodwill finds. I enjoy using seasonal dish towels. I can always use new ones. will probably use them in my craft room. Aren't these embroidered pillowcases beautiful? I could tell from the feel of them that they've never been used/washed. from the cartoon Rocky and Bullwinkle. I'm toying with the idea of selling some of my finds on my blog. The pillowcases and glass are items I would sell. What do you think when you see my washing machine filled with red? Am I using it to hold punch? Am I going to dye something? Or did I have a major accident? As Paul Harvey would say, here's the rest of the story. I started a load of clothes Friday night because I knew we were going to yard sales early Saturday morning. I wanted the laundry out of the way. At some point, I realized I hadn't heard the washer go through the spin cycle. I walked into the laundry room and found my clothes in that tub full of red water. Sitting. Just sitting. No spinning at all. Then I realized how red that water was in the washing machine. I ran water in the laundry sink and transferred the clothes. I let them soak overnight. Saturday ~ after the yard sales ~ I rinsed them, wrung them out, and hung them outside to dry. Next up was a trip to Lowes to buy a new washing machine. This one was repaired once since we moved here 6 years ago. We figured it was about 12-15 years old. The sales person at Lowes told us the average "life" is now 5-8 years for an appliance. Isn't that awful? The good news is my new washer will be delivered tomorrow (Monday). They will hook it up and take away the old one ~ at no charge. Last, I had to dip out the water in the machine. I started with this small pot before switching to a large McDonalds cup and then a smaller cup. Finally, I put a towel in the bottom to soak up the water that was left. Why was the water red? Well, at Goodwill, I bought a sweatshirt and a dress that were maroon. I assumed they had been washed before. What's the worst laundry mistake you've ever made? When we lived in Frederick County, hubby and I loved going to auctions. Our favorites were the ones held in the yard of the homeowners. There was always a church with a trailer set up to sell food. The menu always included country ham biscuits, hot dogs, and homemade desserts. There were old timers who could tell me what the truly vintage items were and how they had some just like them at home. (I love talking to people.) There were young people, just starting out, looking for bargains. Then there were people like us, just out to have a good time - and eat a country ham biscuit! Since we've moved to Roanoke, we haven't found any auctions like that. Imagine our excitement when we saw a sign for an auction as we were out yard saling a few months ago. We eagerly parked the car and walked several blocks to the house where the auction was being held. Yes, I read the sign, but only the large bold print. Then we walked all around the house, looking for items of interest. The old timers were definitely there. But, where were the boxes of dishes and linens to pay through look through? Where was the furniture? Most important of all, where was the food trailer? Here are pictures of what we did see. 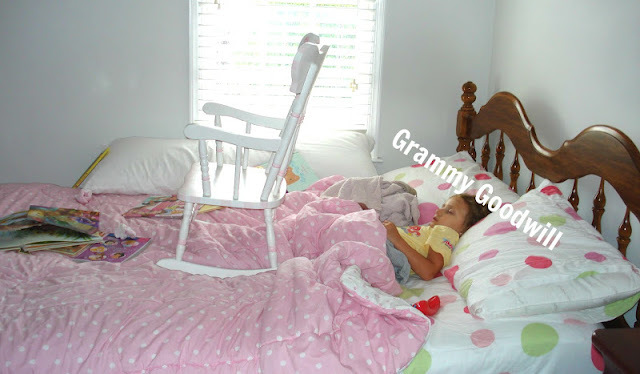 I am a proud grandmother, hence the Grammy part of my name. I love shopping at Goodwill stores, hence the last part. Since I've retired, I've become addicted to reading blogs. I've tried a few ideas and I'm looking forward to more time for crafts and thrifting. Thanks for visiting my blog.